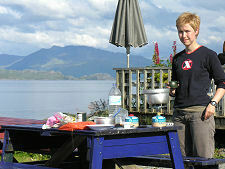 Armadale Bay with the Mountains Around Loch Hourn in the Background. 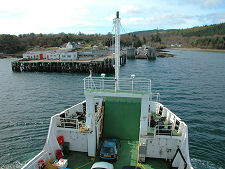 The ferry terminal can be seen on the right, and the old pier on the left. Armadale is Skye's back door. 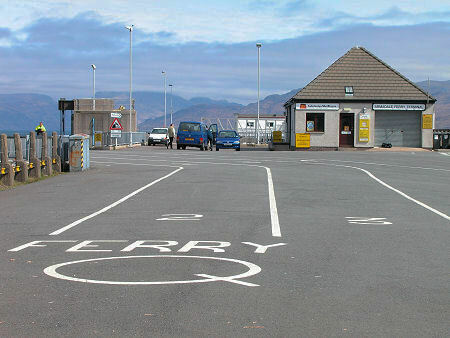 It is here that the ferry from Mallaig arrives, providing visitors with an exciting alternative to the Skye Bridge or the Glenelg Ferry: and one that keeps alive the romance of visiting what indisputably remains an island. And with the dramatic improvements seen in recent years to the roads from Fort William to Mallaig on the mainland side, and from Armadale to Broadford on Skye, even when you take check-in times into account the time difference between this route and the long drive around via Glen Shiel and Kyle of Lochalsh may not always work out the way you might expect. 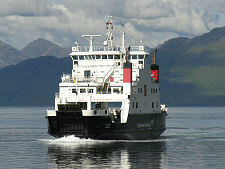 Travelling from Mallaig also gives you a spectacular first glimpse of what Skye has to offer. The Sleat Peninsula on which Armadale is located is fairly low lying, and your attention is gripped by the startlingly jagged peaks of the Cuillin mountains towering above it: despite their location 15 miles further away. There's a temptation for those arriving by ferry at Armadale to simply drive off the ship and keep on going, making the most of the improved roads linking Armadale with the rest of Skye. Those who do so miss a great deal on offer in this little-known corner of the island. For a start, Armadale is not at the end of the peninsula it stands on. Taking a left turn where the main road from the ferry terminal turns right to parallel the coast takes you along the single track road into the village of Ardvasar: and then beyond, along the road to Aird of Sleat, which offers some of the most magnificent views in Scotland. Armadale itself has grown beyond the ferry terminal that first focused development here. 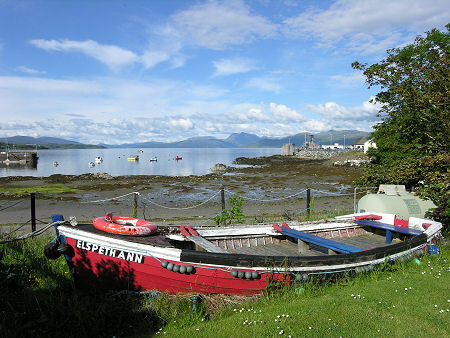 To the north of the ferry terminal is Armadale Bay, home to the active moorings of Skye Yachts with their yacht charter and boatyard services. 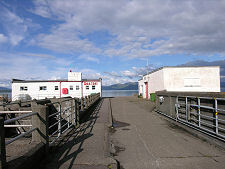 Their base of operations is the old stone pier on the north side of the bay. 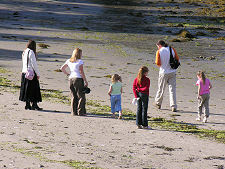 Armadale Bay is also home to a respectable beach at low tide, again with outstanding views. For those spending a little time here, it is worth knowing about "The Shed". 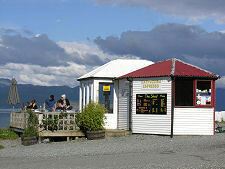 This tiny cafe close to the landward end of the pier offers a surprisingly wide range of good food and drink: plus excellent ice creams. 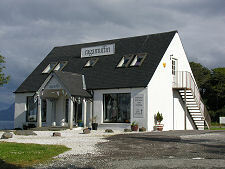 Less immediate needs are catered for by Ragamuffin, a clothes and gift shop on the shore near the terminal, and by the Bay Pottery. Nearby is Skyelark, selling a range of arts, crafts and gifts. Skyelark is also home to grumpygeorge photography, offering superb landscapes printed on canvas. 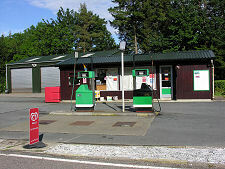 Passing the nearby junction with the side road to Ardvasar brings you to Armadale's community run petrol station, also home to the Tourist Information Centre, while nearby is a fairly small housing development. Travel beyond the village itself and you find yourself passing on your left a white building with a castellated tower that was originally built as stables for Armadale Castle, and which now serves as a restaurant for the Clan Donald Centre. 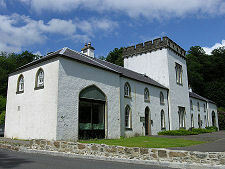 The Clan Donald Centre is Skye's best visitor attraction and comprises two main elements in addition to the old stables obvious from the main road. 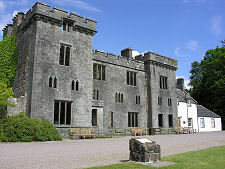 Armadale Castle Gardens are 40 acres of gardens surrounding the ruins of Armadale Castle. Within the gardens is the magnificent Museum of the Isles, purpose built in 2002 and size-for-size the best museum in Scotland. The road out of Armadale comes as a real surprise for those who have not visited in a while. The tortuous single track road that used to cling to the shoreline has gone, replaced by a high quality twin track road built for its first mile on land reclaimed from the sea. A mile and a half north east of Armadale is the small settlement of Ostaig, close to the junction with the minor road to Tarskavaig. Since 1973 this has been home to Sabhal Mòr Ostaig, "a centre of excellence for the development and enhancement of the Gaelic language, culture and heritage". This was the brainchild of the late Sir Iain Noble, then owner of the Isloeornsay Estate that covers much of the Sleat Peninsula. 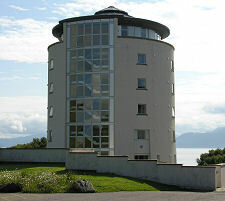 In the late 1990s Sabhal Mòr Ostaig expanded significantly to include a new campus in a magnificent location overlooking the Sound of Sleat. Current student numbers are around 100 on full-time courses, about 160 on distance learning courses, and up to 900 who enrol on short courses each year. The Shed: Excellent Cafe & Ice Cream!